The Volkswagen Group today officially launched its new mobility services company at the "Tech Crunch Disrupt" technology event in London. With MOIA, the automaker is systematically driving forward its transformation into a globally leading provider of sustainable mobility. "MOIA will help us gain a deeper understanding of new forms of mobility and how to make them even more attractive in future, to offer a much broader scope than at present and to tailor these services to suit very wide-ranging needs. Even though not everyone will still own a car in future, MOIA can help make everyone a customer of our company in some way or another", Matthias Müller, CEO of the Volkswagen Group, said. The automotive industry is undergoing rapid change. Alongside the traditional automobile business, innovative, digitally networked mobility services promise a high growth dynamic. With MOIA, Europe's largest automaker is laying the foundations throughout the Group and across all brands for sustained success in tomorrow's world of mobility. What is more, the Volkswagen Group intends to generate a substantial share of its sales revenue from this new business by 2025. 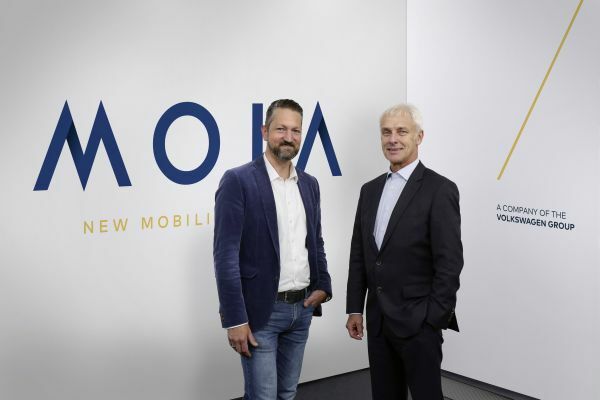 "MOIA is a stand-alone company under the Volkswagen Group umbrella, and will develop and market its own mobility services either independently or in partnership with cities and existing transport systems. In parallel, the Group brands will continue to move forward with their own services. Our sights are set on becoming one of the global top players for mobility services in the medium term. To achieve that we will be seeking to attract the best minds and technology start-ups", Ole Harms, CEO of MOIA, said. The Volkswagen Group's new company, which will be headquartered in Berlin, will begin operating with a team of around 50 – with this number growing fast up to the end of 2017. "The metropolis of Berlin is the perfect location for a future-oriented and innovative company like MOIA because this is where we will find the creative minds and start-ups we need to establish our new business activities. With MOIA, we want to demonstrate that innovative mobility solutions are possible outside of Silicon Valley", Harms explained. A further important location in Germany for MOIA will be the city of Hamburg. Back in the fall, the Volkswagen Group and the Hanseatic city agreed a three-year strategic mobility partnership to make urban mobility more environmentally-friendly, safer, more reliable and more efficient. The findings from this partnership will also be incorporated in future MOIA projects in Europe. The management team of MOIA is made up of Ole Harms (CEO), Dr. Frank Dilger (CFO) and Robert Henrich (COO), who will take up his post on January 1, 2017. An Advisory Committee chaired by Thomas Sedran, Head of Group Strategy at Volkswagen AG, will support MOIA's leadership team. "As customers' needs change, so does the automobile business model. In the world's major urban areas, there is an ever-stronger trend away from owning a vehicle towards shared mobility as well as mobility on demand. That is why the Volkswagen Group anchored new mobility solutions and digital services as core elements in its future program ‘TOGETHER – Strategy 2025' in order to secure a position as a globally leading provider in this field, too", Sedran said. Individual mobility for everyone – that is what MOIA stands for. Convenient, at the touch of a button, at affordable prices and without having to own your own car. The biggest potential for MOIA in a first step is business in ride hailing via app. The Volkswagen Group already opened the way for new mobility concepts with its stake in Gett, one of the world's leading ride hailing providers. Gett app users can already instantly book on-demand transportation, delivery and logistics in more than 100 cities worldwide. "Together with Gett we are pursuing a clearly defined expansion strategy in Europe – only recently, three of the Group's brands launched the first joint initiative with attractive vehicle packages for Gett drivers in the growth market of Moscow. Further markets will follow soon", Harms said. At the same time, MOIA is also focusing on the second major area, namely the pooling business. The company's goal is to set up its own on-demand pooling services via app – also known as connected commuting. The objective is holistic transport solutions that make individual transport and public transport more effective, thus avoiding unnecessary journeys and optimizing use of the existing road infrastructure. This approach concentrates on cross-boundary transport. The first pilot projects in this field are scheduled to begin in 2017.